Saturday January 1st 1921 Hattie and I were both down to Fannies a little while in the forenoon. Aunt Emma called and invited us to dinner with her family. We called a taxi to take us. We sent a pleasant day and the dinner was fine. We rode down town on the car and walked over home. It has turned much colder. I wrote Lydia & Stella in evening. Sunday January 2nd 1921 It was a fine day. Hattie walked to S S and church. I was busy getting things ready to pack and cleaned up my room. Hattie was down at Otts after dinner. I went later and called at Dunlaps on my way home. I read most of the evening. Ott got home this morning and Rob & Cora tonight by way of Cedar Rapids. Monday January 3rd 1921 I was busy most of the day with my packing. Cora was at the store. I went down to Fannies just before night. I read aloud to Hattie most of the evening. 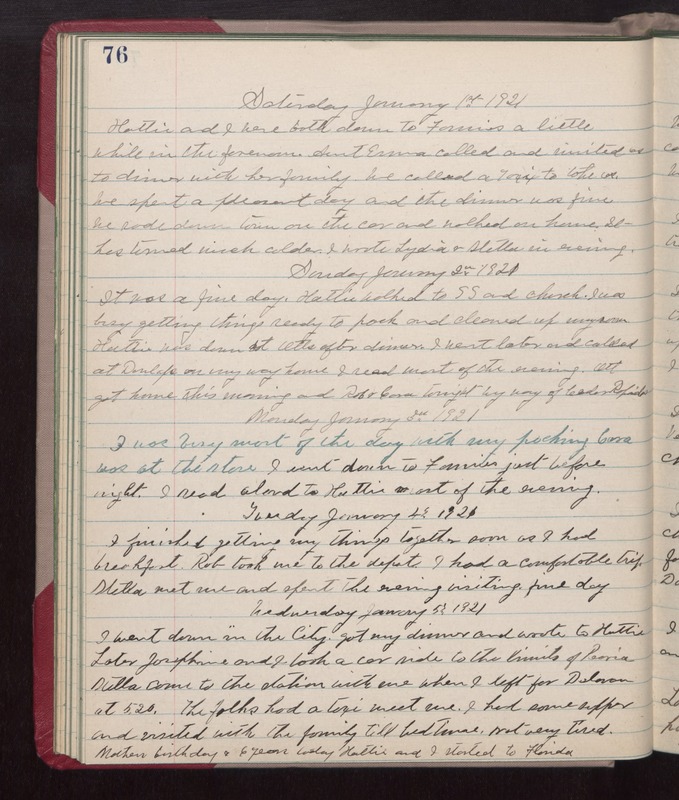 Wednesday January 5th 1921 I went down in "the City." Got my dinner and wrote to Hattie. Later Josephine and I took a car ride to the limits of Peoria. Stella came to the station with me when I left for Delavan at 5.20. The folks had a taxi meet me. I had some supper and visited with the family till bed-time, not very tired. Mothers birthday & 6 years today Hattie and I started to Florida.